By Mike Smith: A bitter sounding Adrien ‘The Problem’ Broner (33-4-1, 24 KOs) wasn’t interested in taking the high road last Saturday night following his loss to WBA ‘secondary’ welterweight champion Manny Pacquiao (61-7-2, 39 KOs) at the MGM Grand in Las Vegas, Nevada. Rather than giving the 40-year-old Pacquiao credit for having beaten him, Broner seemed to suggest that he was given a loss in order to pave the way for a big money rematch between Pacquiao and Floyd Mayweather Jr., who just happened to be ringside watching the spectacle last night. Broner was in no mood to admit that he’d been beaten by the better man. The judges appeared to bend over backwards to give Broner a lot of rounds that he arguably didn’t deserve. At best, Broner won two rounds in this view of this writer. At worst, Broner was shutout completely in losing 12-0. It would be fair to give Broner two rounds last night, but definitely not four, which is what two of the judges gave him. The scores were 117-111, 116-112 and 116-112, all for Pacquiao, of course. 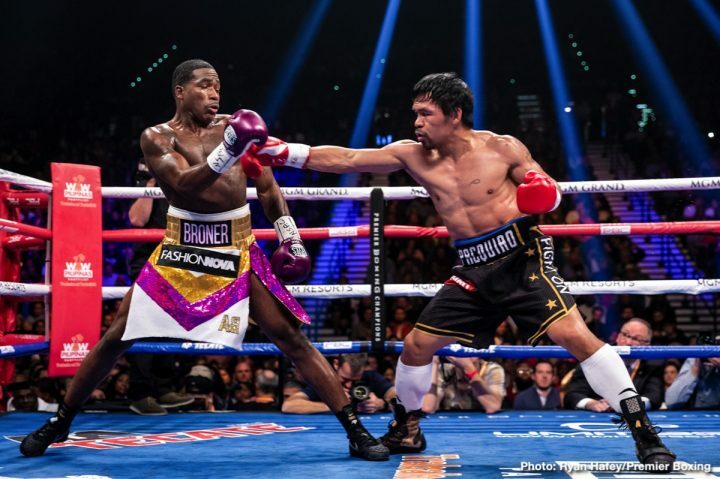 If last night’s fight was a battle in war time, Broner was completely routed by Pacquiao. It wasn’t even a fight. Pacquiao had the superior armament and he did whatever he pleased against a fighter that brought the wrong weapons into the battle. Broner needed to throw combinations, and press the attack. Instead of doing that, the 29-year-old Broner stood stationary, waiting to counter Pacquiao with single shots. It was the wrong weapons from Broner for the type of battle that was being conducted last Saturday night in front of 13,025 boxing fans at the MGM Grand in Las Vegas, Nevada. It was unfortunate to see Broner going off into the direction of conspiracy theories to explain why he lost the fight last night. Broner’s last comment to Gray about how he’d be 7-0 if he was fighting him, sounded childish. At that point, Gray ended the interview. Broner lost two fights last night, to Pacquiao and Gray. In hindsight, it would have been better if Broner stormed out of the ring without giving an interview. He was clearly too keyed up at that point to be asked questions by Gray, and he should have walked out of the ring rather than going off into outer space in suggesting that his loss to Pacquiao was the result of a bigger fight between Mayweather and Manny about to be made for later this year.